FRESH from causing trouble in Australian supermarkets, a 100 per cent plant-based “meat” is at the centre of a ruckus caused by an in-flight burger served by Air New Zealand. 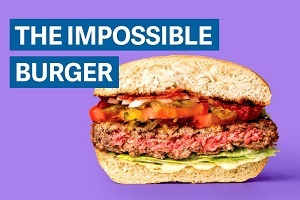 Kiwi Acting Prime Minister Winston Peters has effectively accused the national carrier of treason by teaming with Silicon Valley start-up Impossible Foods to offer the plant-based Impossible Burger on international flights. “When Air New Zealand was in financial trouble it was bailed by the taxpayer and a lot of farming, agricultural money,” Mr Peters said last week. Impossible Foods spokeswoman Rachel Konrad said it was great that Air NZ is giving some passengers the option of ordering the California-made, plant-based Impossible Burger on flights out of LAX. “The awards-winning, customer-focussed airline is also giving passengers the option of ordering animal-derived meat from New Zealand,” she said. “In addition to providing more options for customers, serving the Impossible Burger at 9,000 feet is sparking an important and urgent dialog about how our food choices play a leading role in our carbon footprint. “The bottom line is more and more consumers want sustainable foods – whether they’re eating at restaurants, at home or in flight. The burger’s key ingredient is an iron-containing molecule called heme, which comes from the roots of soy plants and is the same as the heme found in animal meat. “The result is a plant-based burger patty that cooks, smells and tastes like beef but contains no animal products,” Impossible Foods says. Impossible Foods chief executive and founder Patrick O. Brown said the Impossible Burger is available in nearly 2500 US restaurants. Mr Brown started Impossible Foods in 2011. It spent five years and more than $220m researching every aspect of the sensory experience of meat, from how it looks raw, to how it sizzles, to its texture. Water, textured wheat protein, coconut oil, potato protein, natural flavours, 2 per cent or less of: leghemoglobin (heme protein), yeast extract, salt, soy protein isolate, konjac gum, xanthan gum, thiamine (vitamin B1), zinc, niacin, vitamin B6, riboflavin (vitamin B2), vitamin B12. A Woolworths (Australia) decision last month to stock plant-based meat substitute Minced in its meat section prompted an angry from the meat and livestock lobby and some politicians who wanted it removed. And it was the same story in Denmark, when the makers of Minced launched their product there.